It’s the start of May, but contrary to many thoughts, it is not too late to apply crabgrass preventer to your lawn. 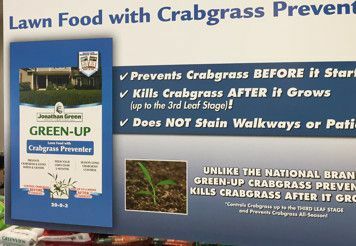 This is because, Jonathan Green’s Green-Up with Crabgrass Preventer actually kills young crabgrass plants up to the 3 leaf stage (about 4 weeks from actual germination). So if you have been focusing on other areas of your lawn or just too busy, consider using Jonathan Green’s crabgrass preventer to KILL and PREVENT hard to kill grass-like weeks anytime through the month of May. It is best when applied and then watered in. If you have seeded your lawn this spring, please be sure you have been able to cut the grass a few times before applying this product as to not cause any damage to the young grass blades. One application will continue to work up to 4 months after application, however, if you have a heavy problem and want to stay out ahead of crabgrass, then you can apply a second application after a couple of months.